It was dirty, rusted and completely unusable. I walked right by it, heading straight for the table of loose tools and shop gadgets. But then, my eyes drifted back, drawn by the shame of its condition. Like a lookey-loo on the freeway, gawking at the wreckage, I just had to look at it’s condition. It was an Underwood typewriter, the kind that my grandmother might have used at her factory secretary job Or the kind that reporters used to bang out their news stories, one letter at a time. It was the kind that the would-be writer would clackity-clack pour their hearts and souls, wondering if anyone would ever understand. Was it lost, buried in a pile of rubble? Was it left outside to the ravages of nature, it’s case exposed to the winter’s snow and spring rains? Was it forgotten in an old garage, home to mice that ran across the keys and spiders’ webs to build? But someone had found a little value in it, even as an oddity. And rather than deposit it in the green dumpster in the alley, it now sat on the same table as porcelain dishes and old magaznes and late night television exercise contraptions still in their boxes. This once glorious instrument was now nothing more than another piece of junk at a garage sale. Three dollars. That was the price. Really, even that was too much for something completely disabled . But it needed to be rescued. How many love letters were tapped out on its keys after the girls were put to bed and the radio with it’s news of soldiers marching in foreign lands was turned off. How many novels were started, with halting dark-and-stormy-night first lines typed, then pulled out in frustration and thrown away? How many recipes were copied, each letter copiously typed so the muffins would turn out just right for Sunday dinner? How many sermons were written, heavy sighs expelled over it’s metal case, wondering if anyone would hear, if anyone would care? The degenerate typewriter holds a thousands stories of love found, and love lost. Of hope and brokenness. Of dreams and joy. It was worth nothing really in its current condition. But in my eyes it was worth everything. I picked it up, heavy in my warms, as I walked to the car. I looked down and the dirt and rust were all over the sky blue shirt I wore. I smiled. So this is how grace works. Joining up with Graceful’s Hear it on Sunday, Use it on Saturday. Read other posts here. How many late nights were spent tapping out high school research papers, being careful to leave the appropriate amount of space for footnotes? Ah…memories! Oh, David, I love this-this morning of all days I so needed those last beautiful words, "So this is how grace works." My soul drinks them in. Redemption…grace.Beautiful! Yes, I do think this is how grace works! My mother had one of those! I wonder where it is now. Amazing piece of writing, this. Grace: yes! Like Paul, I consider myself among the worst of sinners. Thankful to be hauled up by the nape of my neck…kissed…dusted off…repaired…As an aside, if you decide to use the typewriter for parts rather than to restore the whole, there are some really fun things to do with the lettered keys! Blessings to you!!! I have little value. I am an oddity (in more ways than one). But like Johnathan’s crippled son Mephibosheth – Jesus lets me sit at his table like I am worthy – when I know I’m not….Beautiful post. Beautiful treasure you have found. Yes, this is how grace works. I'm noticing that in order to be redeemed, the typewriter had to be offered. I must remember, continually, to offer myself. I'll bet you can clean her up and set her on a shelf so she can have a second life as a thing of beauty and honor–even delight–in your study. Love the old and worn out items too. How I hope someone doesn't just throw me to the heap when I am old and rusty. So much beauty in those things of our past that we uncover unexpectly. Still lots of good left in people when some think they should be put on the shelf too, like the old typewriter. Think this might be my favorite post you've written yet. I love it how God restores us in our broken state. I just might write a follow up post to this. You have a very special way of communicating. Straight from God's heart through yours to ours. Thank you for stopping long enough to see what He has to show you and then sharing it with us. I also just read your post on your dad and I agree with the woman who said we are benefitting from your Dad's legacy through you. Beautiful. Beautiful writing, David. 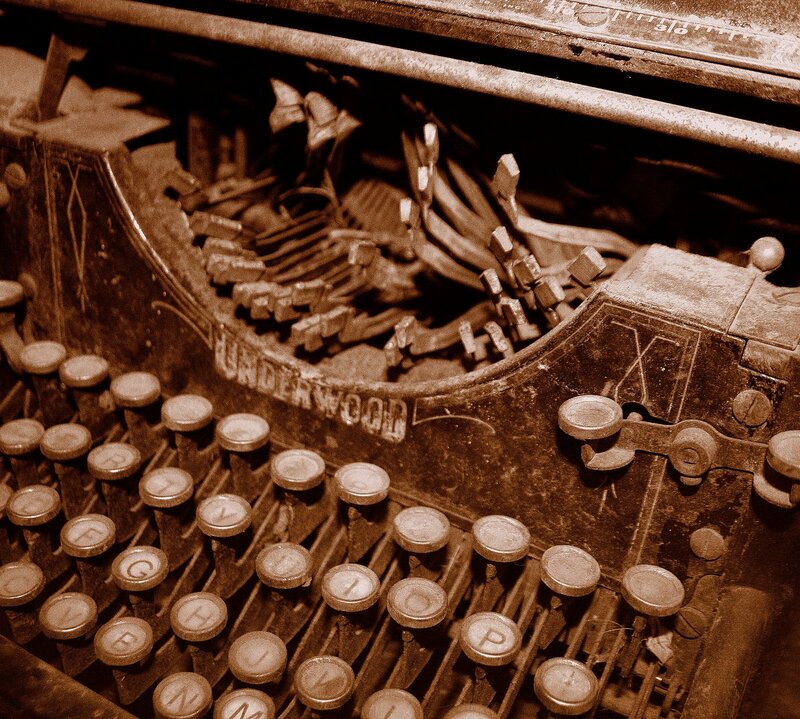 We are the last of a dying breed…people who still remember all the ways a typewriter might have been used. I love your romantic imagination for this one you've rescued. And I love your picture of rust-on-a-blue-shirt grace.